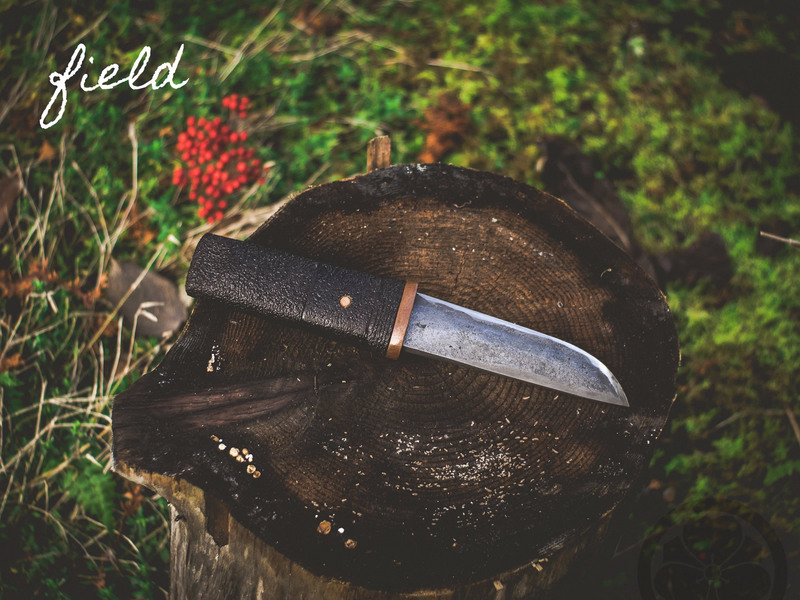 A sturdy outdoor blade designed for brush and garden tasks. 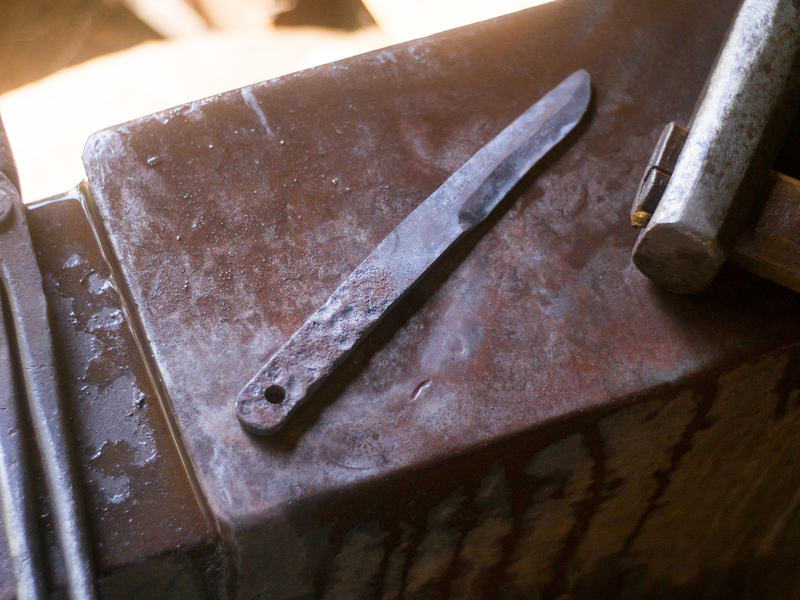 Forged and quenched in hon-yaki swordsmith style and finished in rustic farm style. 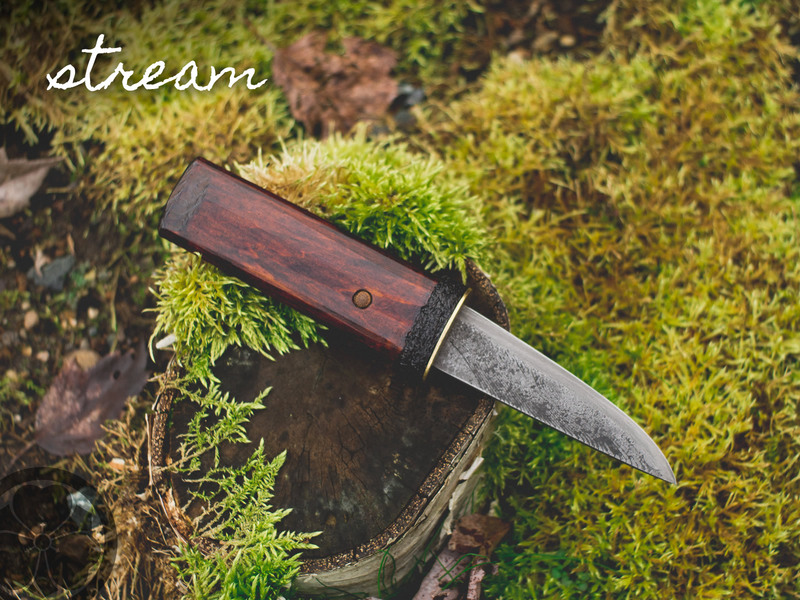 Design your own outdoor knife online. 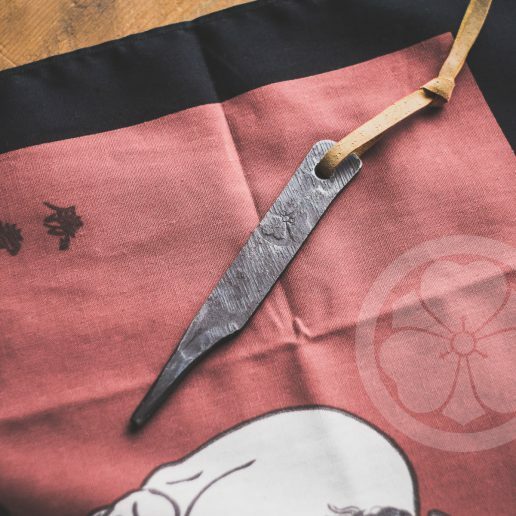 This knife takes its inspiration from the tosu, an elegant form of pen knife carried by scholarly nobility a thousand years ago. 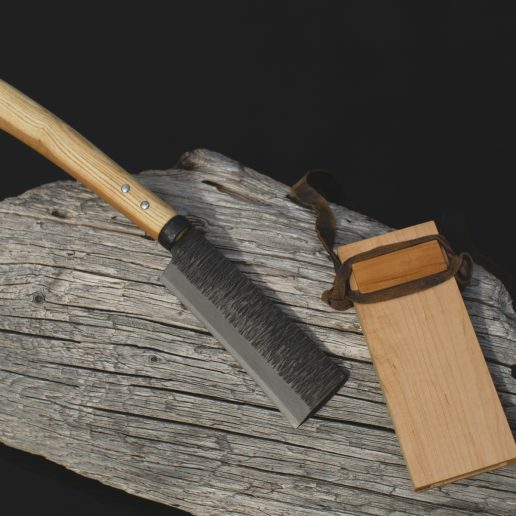 This piece, however, has been finished simply and humbly in the age-old style of a farming and foresting tool traditionally used in the satoyama. Satoyama are the managed forest areas that border the cultivated fields and the mountain wilds. 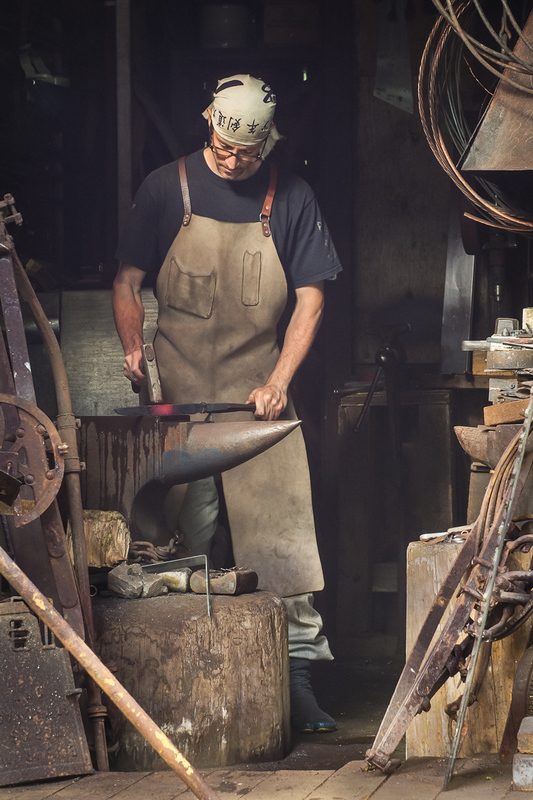 Historically they provided fertilizer, firewood, edible plants, mushrooms, fish, and game, and supported local industries such as farming, construction, and charcoal making. The interaction of wetlands and streams are an important component of the satoyama landscape. 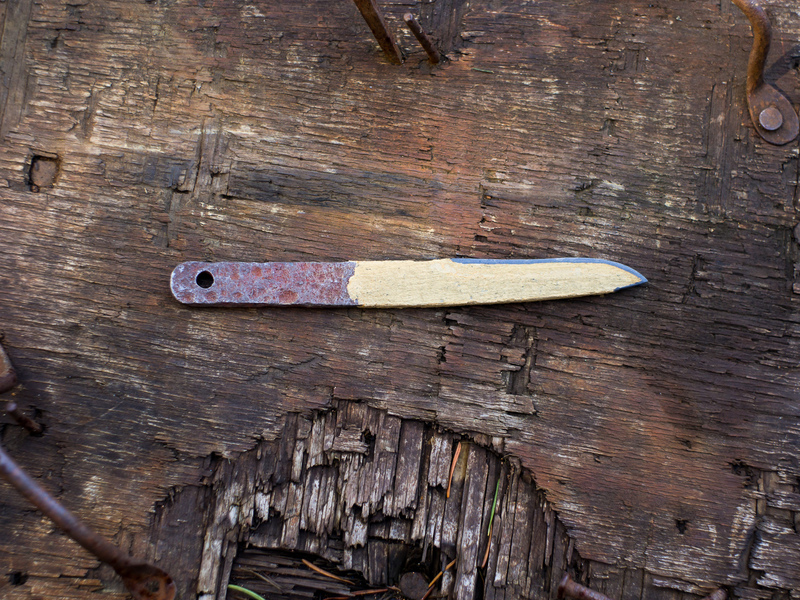 This knife has a slightly dropped tip and was made from a very old German hedge shear blade (originally engraved “Made in Western Germany”). 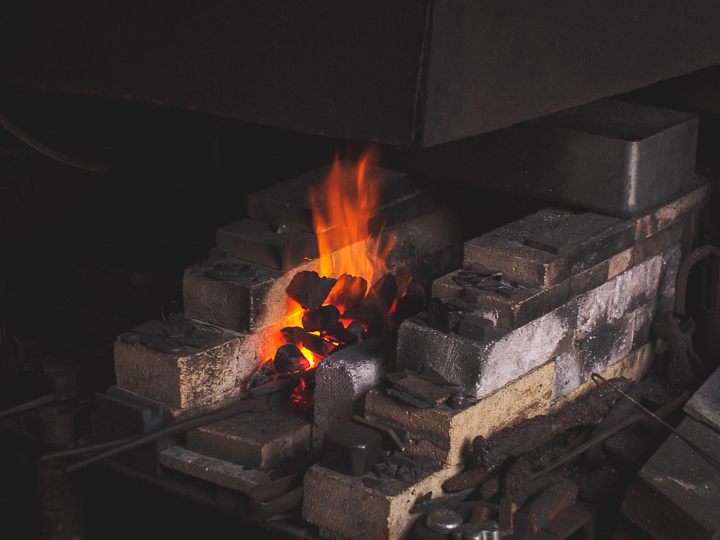 One of the benefits of accurate forging is that small amounts of seemingly unusable reclaimed material can go a long ways. 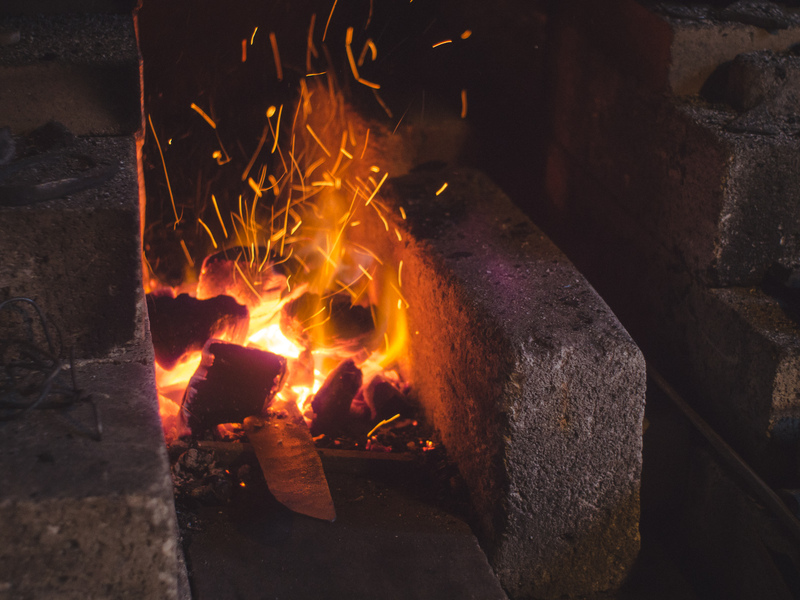 The blade was hand forged in a charcoal fire, shaped with files, differentially hardened using traditional swordsmith style water quench yaki-ire, and polished by hand with water stones. 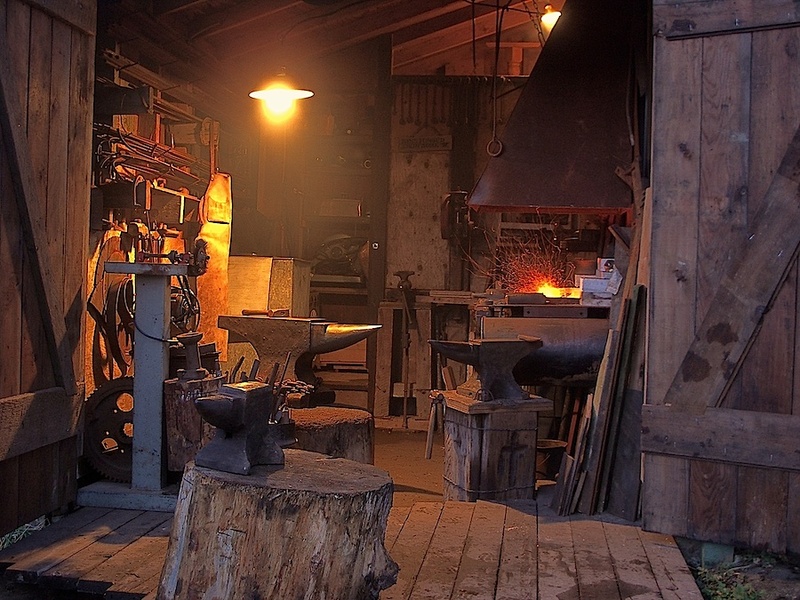 A larger companion knife was forged from a portion of the same piece of steel. 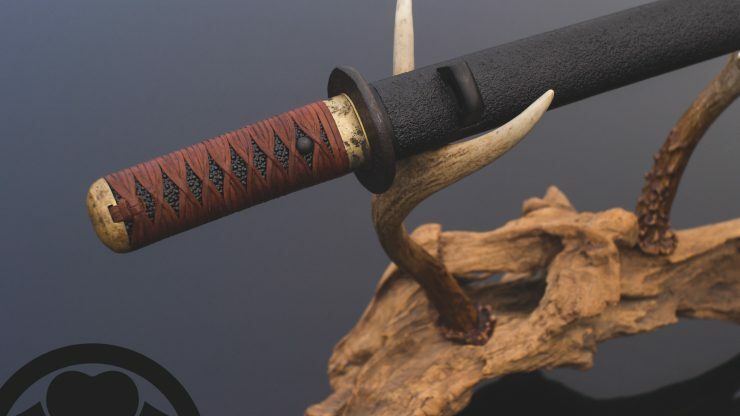 The handle is made from the same steel as the blade and is partly wrapped with cotton cord and sealed with several layers of natural urushi lacquer. 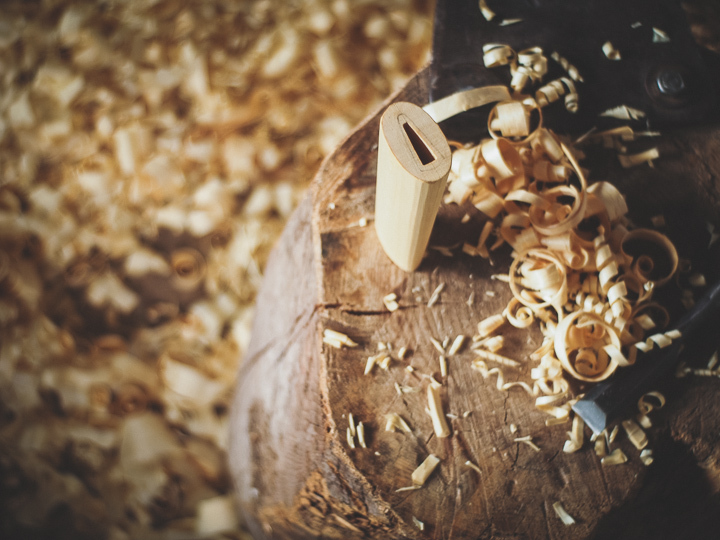 Other than the polished edge bevel, all surfaces have been left as-found or as-forged and the blade finished with a coat of natural tung tree oil. 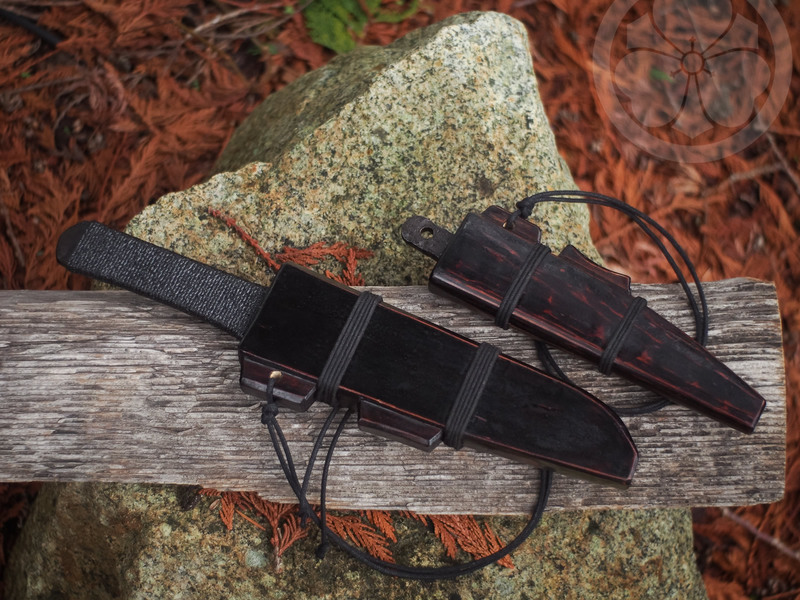 The makiri-inspired wooden scabbard was hand carved and lacquered with a natural and black negoro style to simulate natural wear along the carved striations. 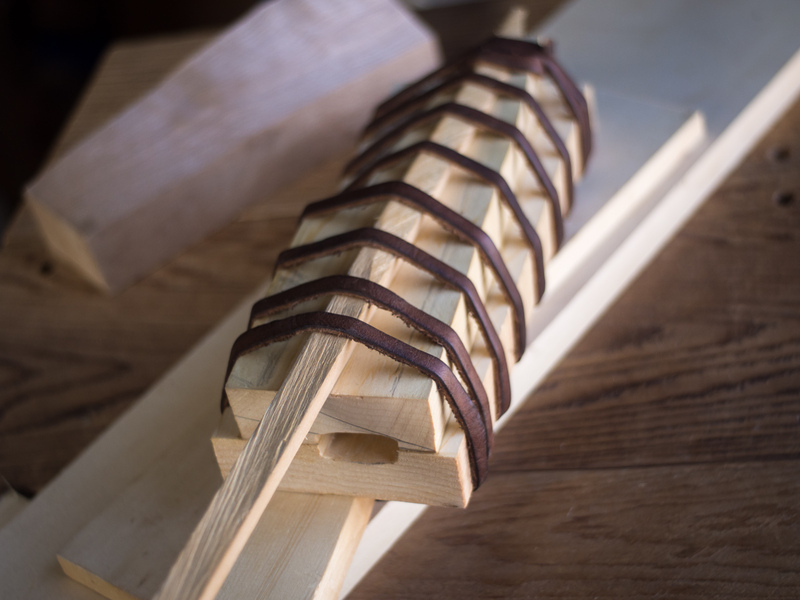 A double cotton cord acts as a sageo for hanging or securing the scabbard as it passes through a belt or sash. 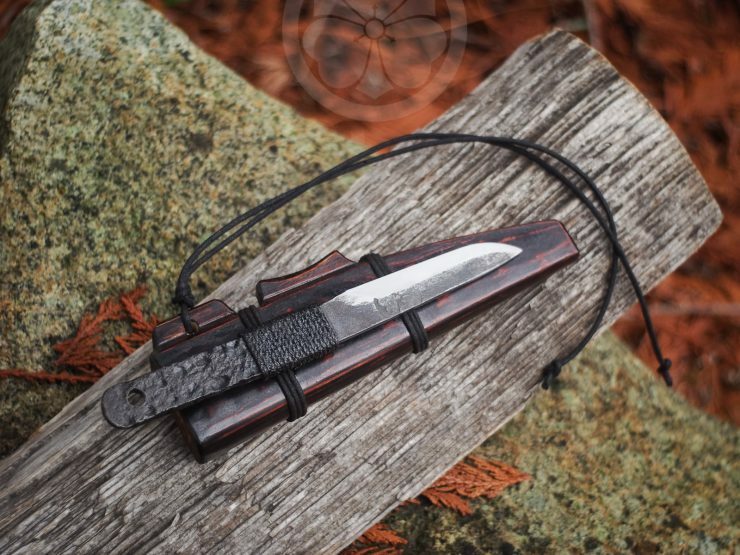 Other than the steel, all of the materials used in this knife are plant based. 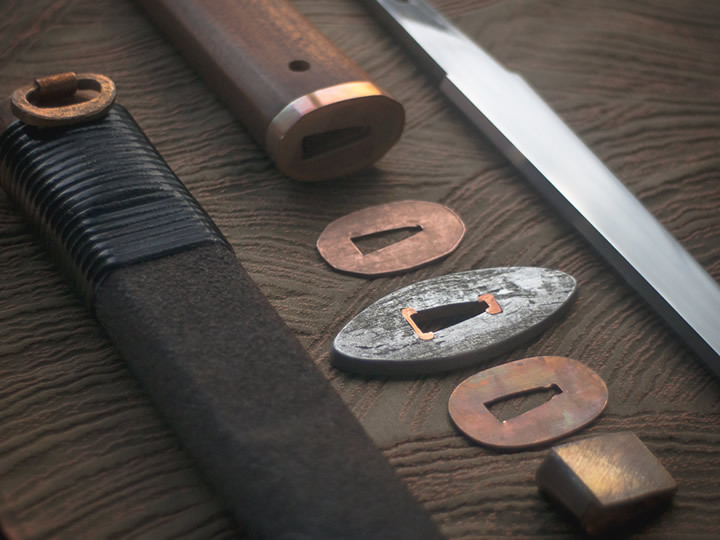 Blade construction is muku/hon-yaki with a shinogi-zukuri profile and hira/kaku mune. 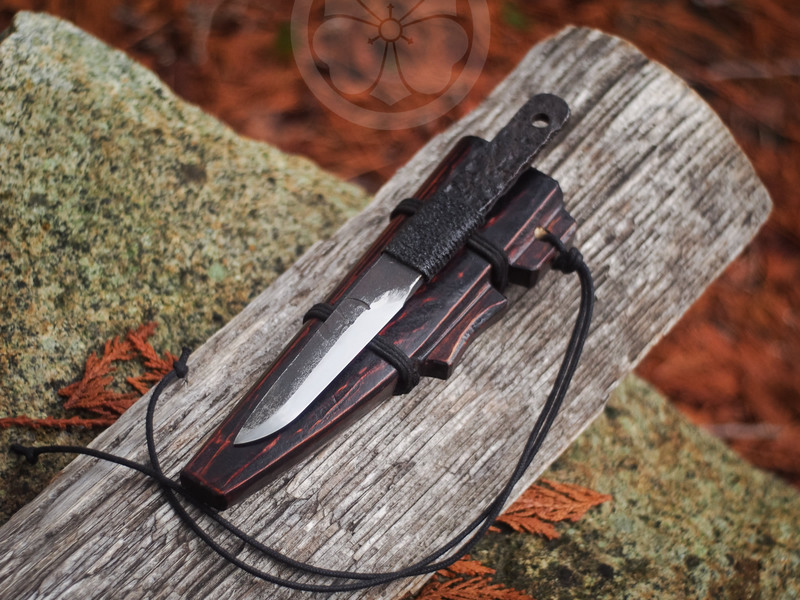 The blade is 3.25″ long and 5/8″ deep with a 5/32″ spine, overall length is around 6.75″. 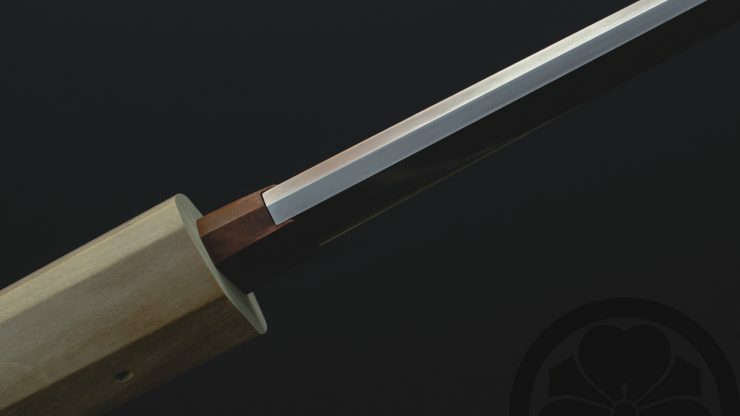 Overall Length when sheathed is 7.5″. 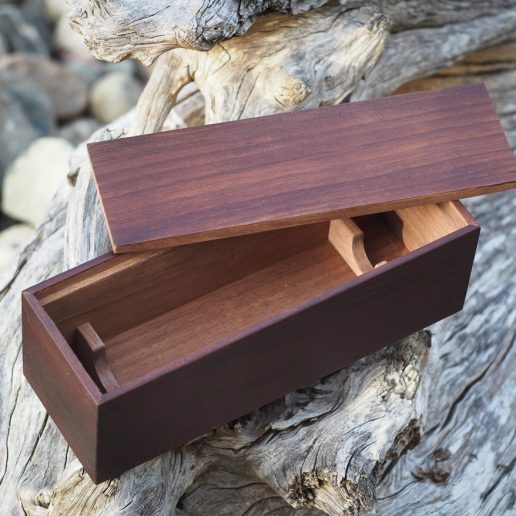 This piece is in a private collection in Virginia. 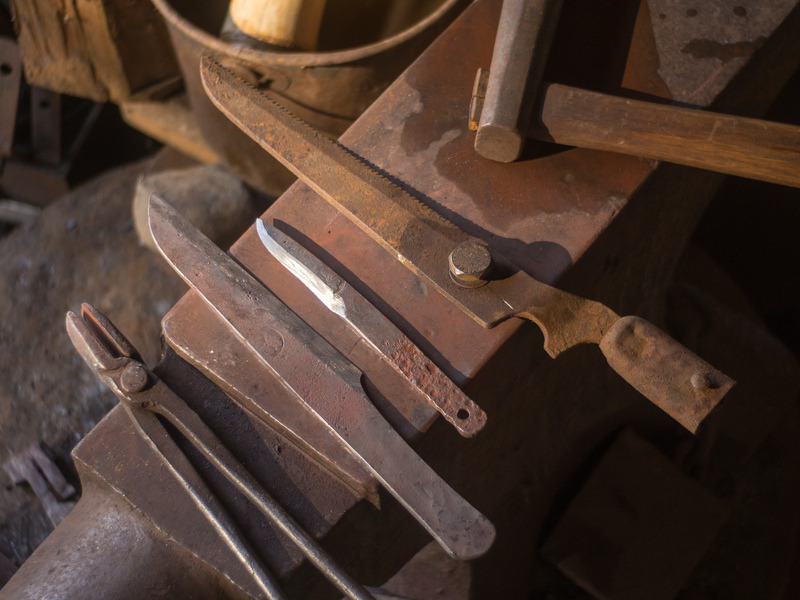 The two knives forged from one half of an antique set of German hedge shears. 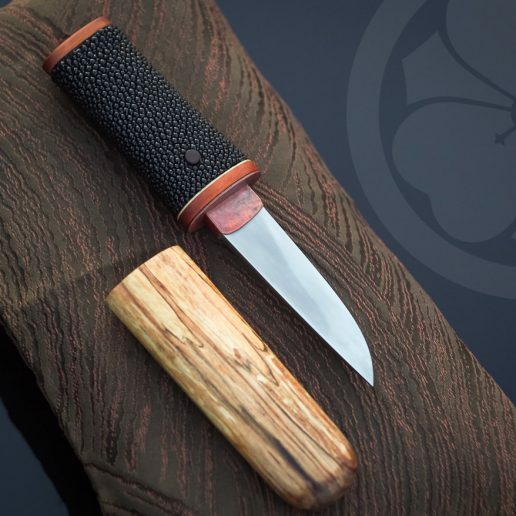 See the other knife here: Hybrid Nata. 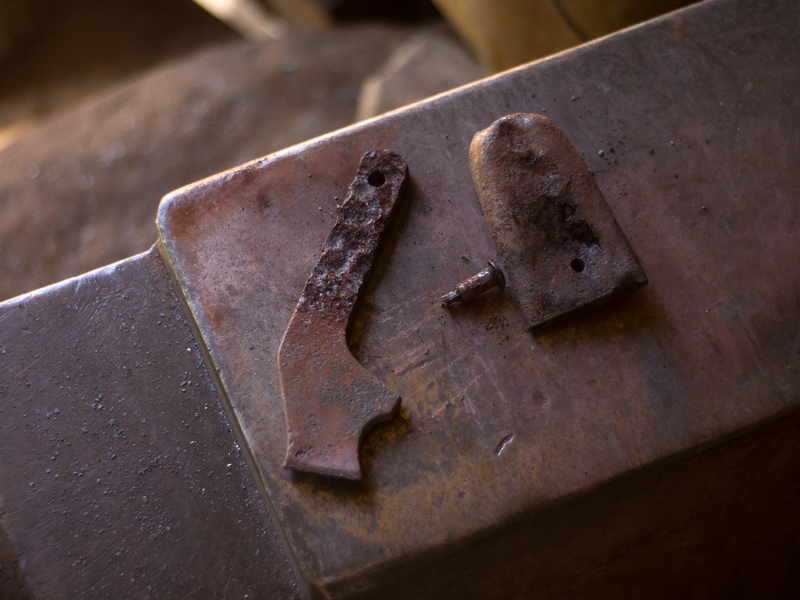 The shear blade split in two right behind the pivot. 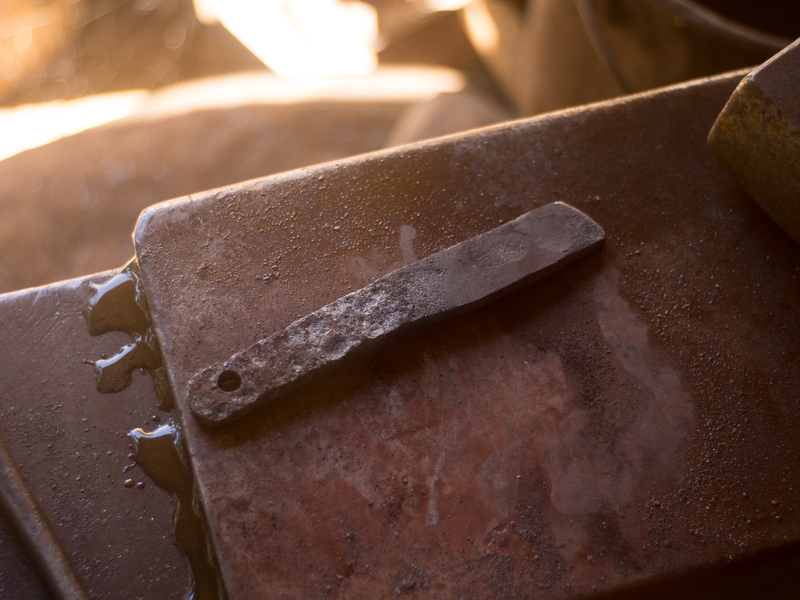 The piece to the right will form this knife, the piece to the left will form the other. The piece of steel as-found, showing the deep cratering of many decades of weathering. At first glance it appears to be good for nothing more than the scrap bin. 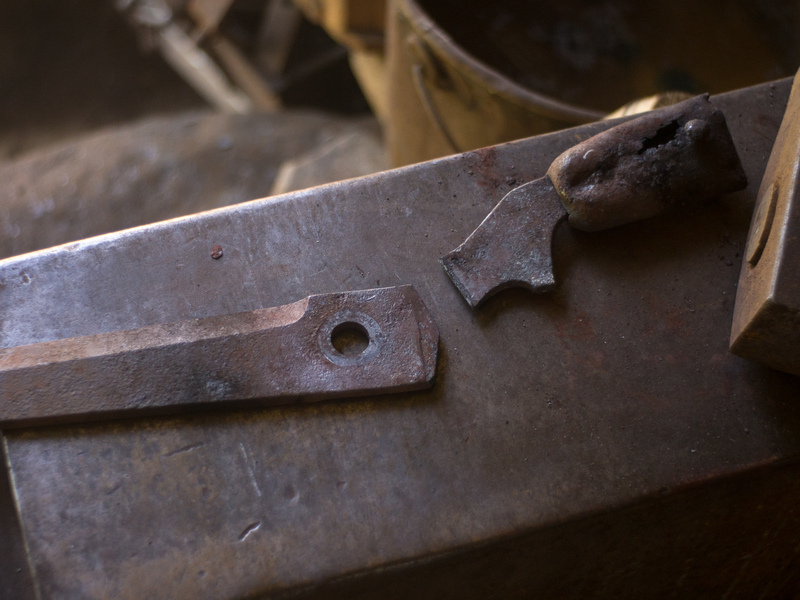 Beginning to forge the oddly shaped steel scrap into a rectangular billet. 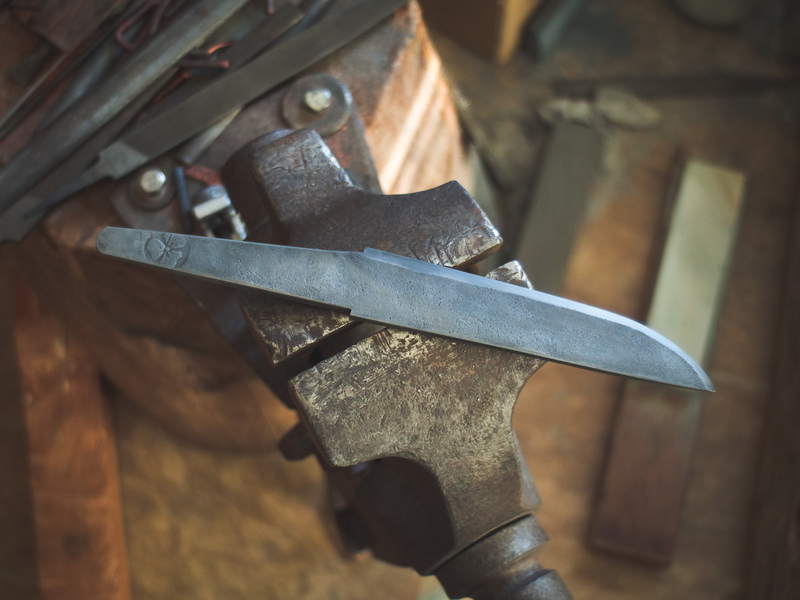 Approaching the sunobe for this knife, all steel has been allocated by volume to a place in the final blade. 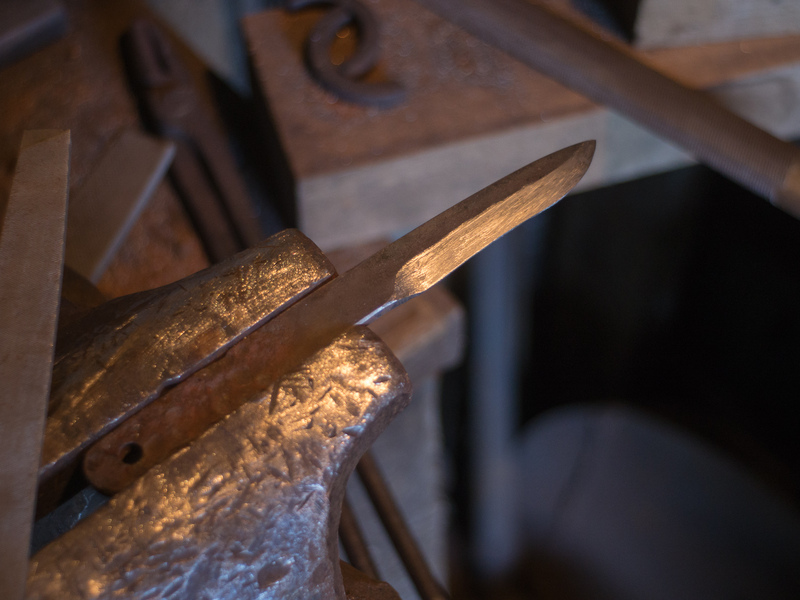 After forging the blade and bevels. The handle is untouched to show the effects of time. 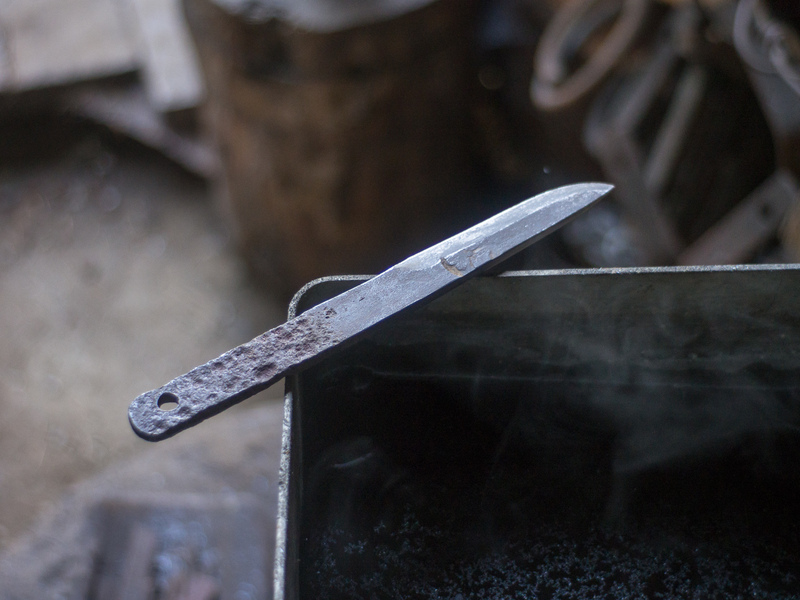 Cleaning up the bevels by hand filing. Coated in different types of clay in preparation for hardening. 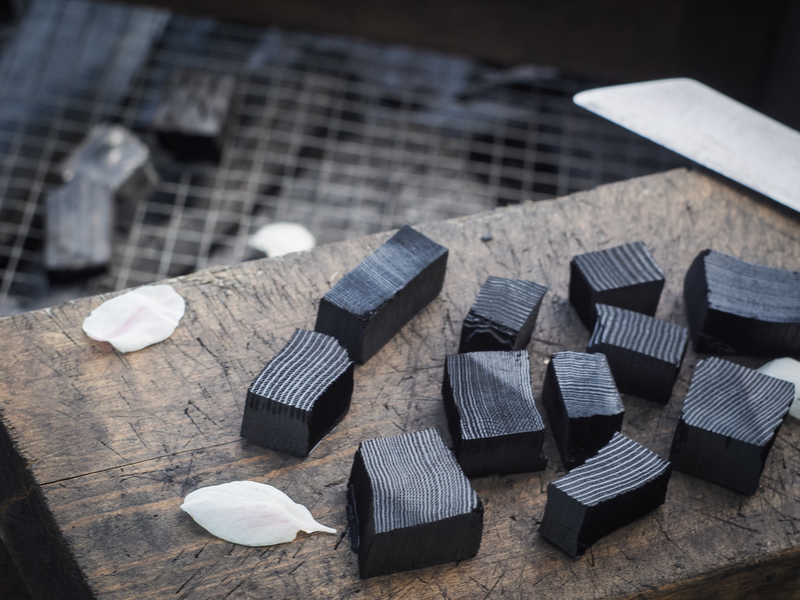 Note the downward curvature of the edge to compensate for the effects of the water quench during yaki-ire. Just after quenching in the water. Note that the edge has straightened considerably. 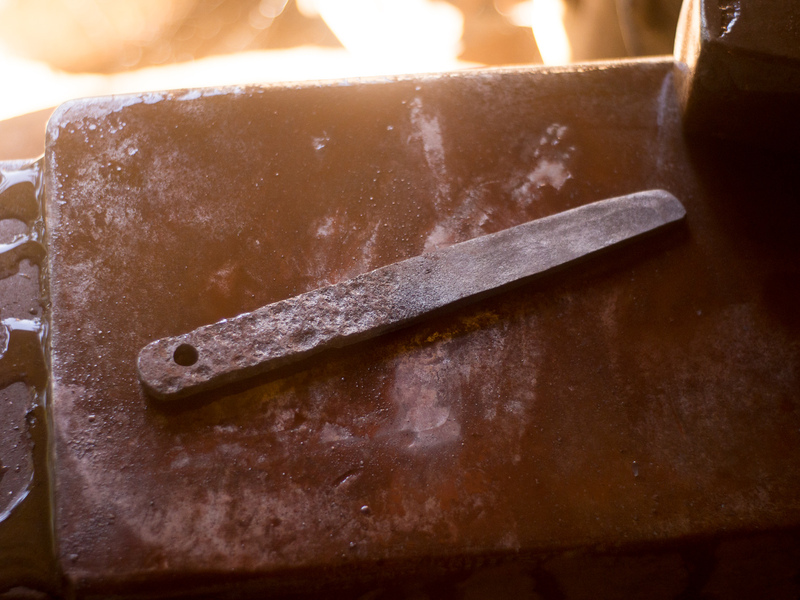 After the core is carved to fit the blade and handle, the halves are joined with rice paste glue and clamped to dry. 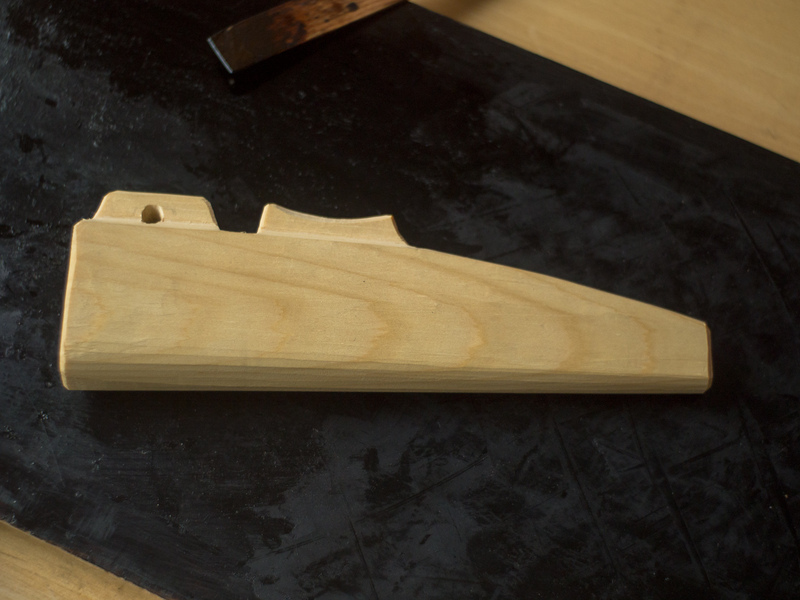 After carving the exterior of the saya, with inspiration from the makiri, the lacquering process begins.